Ingrid Thorburn (Aubrey Plaza) is an unhinged social media stalker with a history of confusing “likes” for meaningful relationships. Taylor Sloane (Elizabeth Olsen) is an Instagram-famous “influencer” whose perfectly curated, boho-chic lifestyle becomes Ingrid’s latest obsession. When Ingrid moves to LA and manages to insinuate herself into the social media star’s life, their relationship quickly goes from #BFF to #WTF. 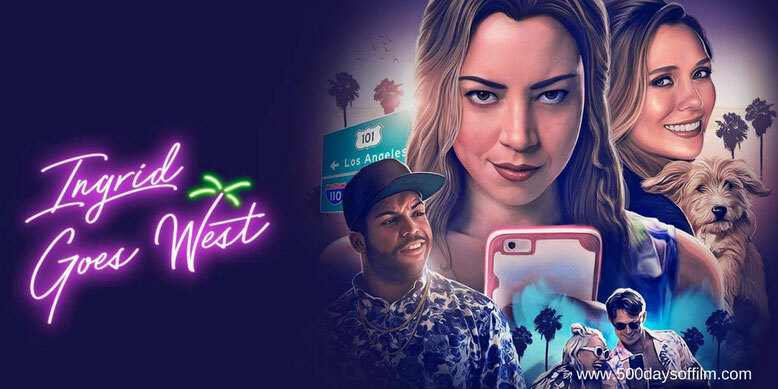 Ingrid Goes West is a surprisingly dark comedy satirizing the world of social media. Featuring a superb performance from Aubrey Plaza (talk about perfect casting), the film places us in an uncomfortable position from the outset. We are asked to sympathsise with an unstable and potentially dangerous stalker. That’s not to suggest that Ingrid does anything to court our sympathy or that director Matt Spicer (who co-wrote the film with David Brandon Smith) excuses her actions. She is selfish and often cruel. Much of what she does is shocking, manipulative and disturbing. In short, this is not an easy character to like. However, largely due to Plaza’s brilliantly nuanced portrayal, we cannot help but root for Ingrid. We sense her grief and her deep social awkwardness. We see how her mobile phone addiction comes from a place of loneliness. She is an outsider desperate to be let in and, in the absence of any real human connection, she seeks validation from social media. So, we sympathise with Ingrid because, while her situation may be extreme, the issues she faces are universal. We laugh with her, not at her. After all, who hasn’t fallen down a social media rabbit hole? Of course, Taylor Sloane (a wonderful performance from Elizabeth Olsen) and her vapid crowd are hardly Ingrid's innocent victims. Taylor is just as selfish and insecure as Ingrid - she is just better at hiding her demons. She pretends to live a perfect life but she's actually peddling an empty existence built on lies. Thankfully, there is light in this hilariously ridiculous, disturbingly nightmarish world. That light takes the form of Ingrid’s landlord, Dan Pinto. Played with charm and heart to spare by O'Shea Jackson Jr., Dan is the only character happy to be himself, the only one with healthy perspective. Obsessed with Batman, Dan believes he is the man to save Ingrid from herself. However, this is not a film that seeks to tie itself up in a neat little #instabow. No, Ingrid Goes West remains committed to its unsettling satire - unwilling to hold back even in its final moments. Ingrid Goes West won the Waldo Salt Screenwriting Award at Sundance. If you have, what do you think of David Branson Smith and Matt Spicer’s film? Let me know in the comments section below or let’s chat (although this feels somewhat odd in this context!) over on Twitter (@500DaysOfFilm).